Apocalypse Now inveigles me to watch just another couple more minutes despite a taxi due at dawn. There is a blink-and-you’ll-miss-it scene where amidst the mayhem of artillery fire, troops land on the beach whilst an hirsute filmmaker yells for soldiers to not look at his camera. I’m watching a film about an invasion being filmed. Clever. I notice something...isn’t that Francis Ford Coppola himself shouting at Martin Sheen? I could confirm with two clicks of a mouse or I can ask Coppola himself tomorrow night. That’s a strange thought, one I could never envisage. Coppola and yours truly: breathing the same air. I switch off the TV. That’s enough napalm for tonight. I need to be bright-eyed and bushy-tailed for an imminent dinner that promises to be as epic as the Godfather. Perhaps even Godfather Part II? Preferably, it will not be as traumatic as Apocalypse Now. This year, the de Rothschild family is hosting three intimate dinners to celebrate 150 years since Baron James de Rothschild’s acquisition of Lafite-Rothschild in 1868. The family is inviting not just a monocépage of crusty old wine writers, but blending artists, actors, chefs and fellow winemakers from Bordeaux and beyond to create a more intriguing blend for each of the evenings. Unofficially it is an opportunity to introduce two faces of the next chapter: Jean-Guillaume Prats who replaces the (shy and) retiring Christophe Salin as CEO and Saskia de Rothschild who steps into the (presumably larger) shoes of her father and chairman, 77-year old Baron Eric de Rothschild, who has run the estate since 1974. It is also a good excuse to mine the estate’s library of older vintages, allowing Jean-Guillaume and Saskia to acquaint themselves with the vinous DNA of Lafite-Rothschild. Each soirée is bejeweled with unique combinations of vintages: young and old, renowned and derided, famous and forgotten. Why vicariously read about great wines when you can taste them? The knowledge gleaned will be priceless going forward. The notes in this article originate not only from the tasting at the property, but also a dinner in Hong Kong that I attended a few weeks earlier, and several other recent tastings. Together they offer a time-arching overview of the wines, if not quite with the comprehensiveness bestowed to Jean-Guillaume Prats and Saskia de Rothschild, who by all accounts may have experienced all 150 vintages under the de Rothschild’s proprietorship. Assembling under the wisteria, Saskia de Rothschild gathers the troops. Saskia de Rothschild’s appointment was a surprise to some, not least because she has two brothers and assorted cousins no doubt gunning for the position to varying degrees of enthusiasm and merit. It sets a precedent or sorts, re-turfs a bit of old Bordeaux. Not only at 31 years is she the youngest proprietor of a First Growth, she is also what is known as a “woman”. Apologies for the glibness, but how many female owners of a Grand Cru Classé can you name apart from Corinne Mentzelopoulos? “Too few” is the easier answer to pronounce. I have only met Saskia de Rothschild three or four times, first introduced during en primeur last year, prior to the official announcement. “Well, you’re different,” I thought. Not because “she” is not a “he”. Rather the combination of youth and unorthodox career path that clearly shapes her perspective on life. Most estate managers tend to learn their viticultural chops at the University of Bordeaux or graduate with MBAs from reputed business schools such as INSEEC, ostensibly the incubator for future Bordeaux proprietors and technical directors. Saskia lived in Paris and New York, trained as a journalist and worked for the International New York Times as an investigative correspondent in countries such as Ivory Coast, Afghanistan and Ethiopia. I remember chatting with her about the latter. It was clear that the African countries made a deep impression, and doubtless it will always tug her wanderlust. Such experiences must seem a million miles away from the one she now enters. I wonder how she reconciles opposite ends of this inequality-riven world? It is an assiduous appointment: an ideal figurehead and decision-maker that chimes with these times of gender equality, the #MeToo era. Knowing a little about her character already, Saskia de Rothschild will not be a frontispiece behind which another person (a man) will run their estates, even though Jean-Guillaume Prats brings valuable experience and business acumen from his time managing Cos d’Estournel and his subsequent tenure at LVMH. As the first female chairman of Domaines Barons de Rothschild, the umbrella company that includes six estates as well as Lafite-Rothschild, de Rothschild now occupies a position in which she will navigate the future, the lodestar. Some might point towards her inexperience: an internship at L’Evangile and assisting the blending at Lafite-Rothschild when she was younger. However, apart from having already been a co-director for two years alongside her father, those that pursue careers outside wine tend to mature into the most rounded and capable managers. She is wisely investing considerable time on the ground, getting the proverbial dirt under her fingernails, mucking in to learn winemaking by praxis, when she could just swan imperiously about the estate. That is clearly not her style. Would such an appointment be conceivable even just a decade ago? Is she surely the first woman to be the boss of Lafite? Well, yes and no. Wind the clock back to the 19th century and wade into the roots that led to Baron James de Rothschild’s acquisition of the First Growth, then you enter a murky world of deception. The 1855 Classification records an Englishman as the owner, since banker and parliamentarian Sir Samuel Scott bought the estate from Mme Barbe-Rosalie Lemaire for one million francs in 1821. The bill of sale stated that the purchase was “...for himself or for a command that he reserved the right to name at a later date.” However, the sale was fictitious, a cover-up that lasted half a century. All the time Sir Samuel and then his son were obeying instructions from Mme Lemaire’s eldest son, Aimé-Eugène Vanlerberghe. His father, Ignace-Louis, had made a fortune working for Napoleon, a rather shady character to say the least. He allegedly “divorced” his wife in 1808, allowing her to “sell” Lafite-Rothschild to Scott and not only avoid inheritance taxes, but avoid settling with creditors after her ex-husband’s bankruptcy. The subterfuge only came to light in 1866 when Aimé-Eugène died childless and his two sisters and a niece inherited the estate. Since none were inclined to continue as co-proprietors, the estate was eventually sold to Baron James on 8 August 1868. So, for fleeting moments, there have been female proprietors of Lafite-Rothschild, but it is bound up with what you might call “dodgy dealings”. 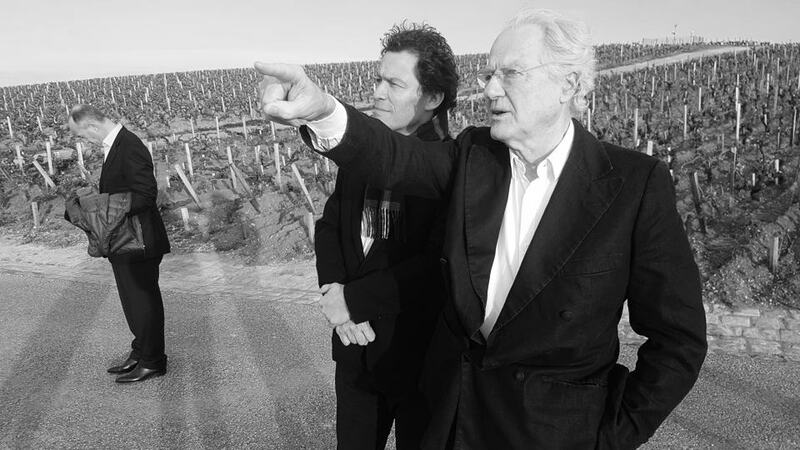 Baron Eric de Rothschild explaining the vineyard to Dominic West. Either that or he is asking about a plotline in The Wire. There were a few “dodgy dealings” depicted in award-winning crime drama The Wire, and, just as I am about to enquire to Francis about his cameo in Apocalypse Now, striding across Lafite’s manicured lawn is one of its main stars, actor Dominic West, all untamed shock of black air, First Growth smile and a surfeit of charisma that oozes all over the parquet flooring. Oddly enough, upon being introduced, West reprises his homicidal detective role and quizzes me about my motive to move to these pastures. He clearly has a simmering passion for wine, a sound knowledge of things fermented, and my career path. I am unsure how familiar Dominic is with the First Growth. 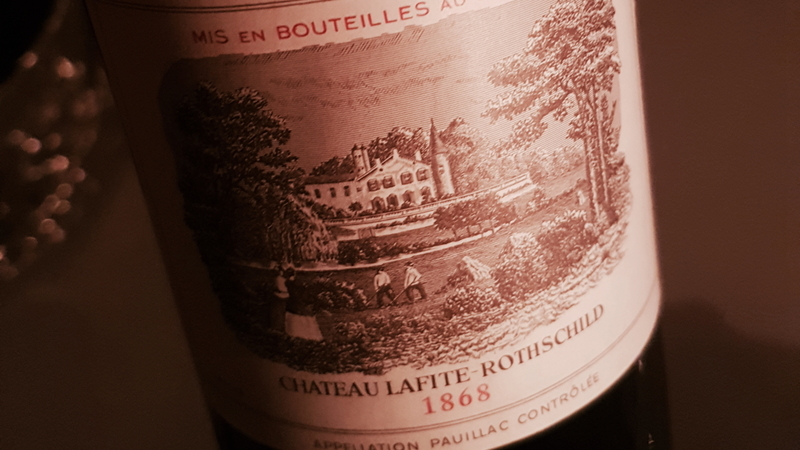 After the dinner, when most people have repaired to the drawing room, we linger over the now empty bottle of 1868 Lafite-Rothschild. Dominic is star-struck by two things this evening. Firstly meeting Francis Ford Coppola for the first time. “I mean, that’s a f**king legend,” he says with barely contained incredulity and he is f**king correct. He is also star-struck by the 150-year old Claret that tastes so fresh and vital, hauntingly delicious, perchance magic derived from those pre-phylloxera vines? According to André Simon, Charles Walter Berry cracked open the 1868 Lafite-Rothschild at the Saintsbury Club in 1942, only to remark it was “sound but lacked charm” and “too old”. Tell that to Dominic West who is having his Damascene moment with the same very alive and very kicking First Growth. Part of me envies West’s wide-eyed wonderment as he experiences the time-buckling capacity of wine. It defies logic. It is not that I am jaded or blasé. I am just as enraptured by the 1868, yet unlike his amazement, mine is half anticipated. I am already aware that a great Lafite-Rothschild and others of its kind can age for over a century. What Dominic is experiencing is like your first kiss. It is not necessarily the best, however, being first means its impact can never be replicated. We join the others in the dining room where the Armagnac flows and Cuban cigar smoke fills the room that drips with antique furniture and portraits of stoic ancestors staring from gilded frames. I have not spoken to Francis Ford Coppola about The Godfather or his cameo. Time is ticking. He must get bored of people asking the same predictable questions. I would love to talk to Dominic West about The Wire, but alas I have never watched a single minute, not because it does not appeal, but the constant travelling and kids preclude time-consuming dramas. Instead I complement him on his performance in Alan Bennett’s superb The History Boys. He gives me a funny look. The following morning I discover that I confused him with actor Dominic Cooper. Oops. The marble bust of Baron James de Rothschild looks upon the guests. Unfortunately he died just a few months after his acquisition, although he did manage to visit the property before passing away. Usually I am spot on when it comes to cultural references. 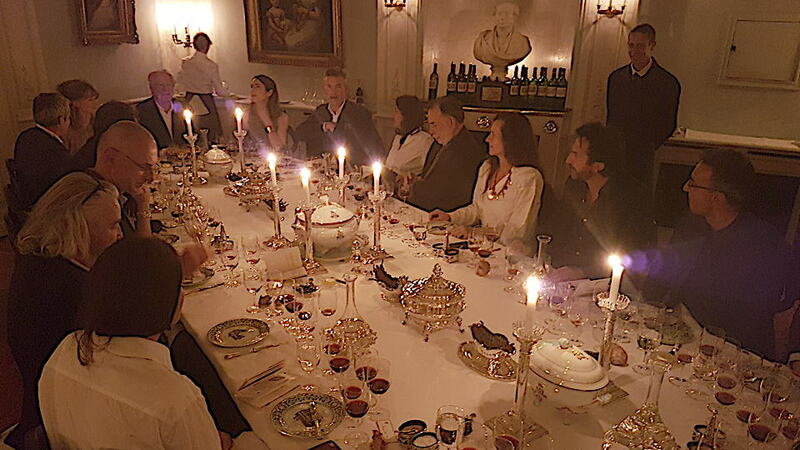 Fortunately at dinner I am seated between Francis’s eldest son Roman Coppola and celebrity chef Mimi Thorisson. I suspect that I am the only person seated around the table au fait with Roman’s memorable videos for The Strokes or his scriptwriting with director Wes Anderson. Mimi is someone that I have wanted to meet. Based north of Saint-Estèphe with so many children that personally I would lose count, she has become a successful celebrity chef in France. We discuss music and in particular Depeche Mode, who recently played at the Bordeaux stadium. According to her, Baron Eric was in attendance and try as I might, I just cannot imagine him arms aloft singing “Reach out and touch faith”. Part of me is not surprised that a 77-year old aristocrat, often attired in brass-buttoned blazer, silk pocket square and brogues, would attend a concert by synth band with a penchant for leather skirts. He is one of those indefatigable people that will be forever young at heart. I suspect he will be just as active stepping back behind his daughter, sage advice constantly at hand. 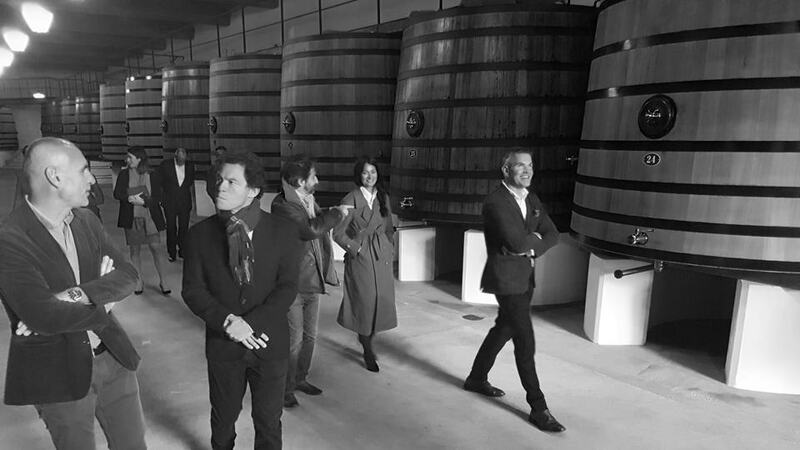 Inspecting the wooden vats at Lafite-Rothschild. Why am I writing so much about people? Surely I ought to be writing about the minutiae of the vineyard and the winery after all, Baron Eric had given us an enlightening tour, standing in front of an old map of the vineyard like an avuncular public school headmaster, Dominic West studiously looking on as if he were in The History Boys – except that he was never in The History Boys. We toured the capacious vat-room and finally assembled in the octagonal barrel cellar for a pre-prandial tasting. I was in unusual good blind tasting form, nailing the 1994 Lafite-Rothschild as I noticed the total absence of Merlot that particular year, identifying the trio of 1988, 1989 and 1990 where surprisingly the 1988 came out trumps. I stupidly mistook the 1920 Lafite-Rothschild for the 1928, knowing the latter was not their greatest success that decade. Still, if you are going to enjoy a rare instance of blind tasting prowess, you might as well do it in front of one of your heroes. 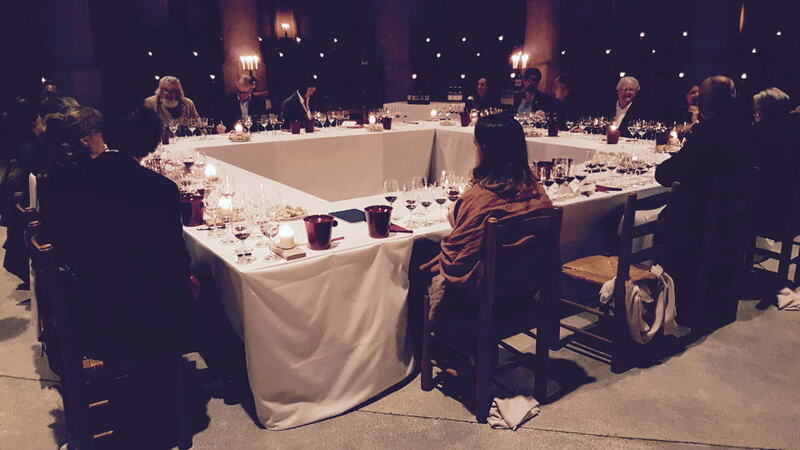 The pre-prandial tasting in the barrel cellar of Lafite-Rothschild where a dozen vintages were poured both blind and sighted. Returning to my original question, I write about the people because this evening was all about their interaction with Lafite-Rothschild. To me at least, the idea is not to appraise the wine within its own hermetically sealed world, unconnected to anything beyond the wine glass, but how it affects the individual and the group as a whole. What led each of us to this place at this time is so astonishingly diverse from person to person. What binds us together? Only one thing: the wine in the glass. Not only is it the reason for this soirée, but also the lubricant for conversation and interaction. Its intoxicating ability is probably the reason why I confused Dominic West with Cooper. It is also the reason why I might lose my inhibitions and pluck up the courage to ask Coppola whether he was that director in Apocalypse Now. It must be said that Lafite-Rothschild is not inclined to “blow you away” like Latour and nor does it have the winsome charm of Haut-Brion, not the glitz of its former rival, Mouton-Rothschild. Lafite-Rothschild is the most subtle and nuanced First Growth and, so unsurprisingly in Hong Kong, whilst the Latour dinner elicited superlatives, the previous evening’s Lafite-Rothschild soirée was met more with a muted response. Maybe they were expecting fireworks. That is just not the style of Lafite-Rothschild, with singular exception of the 1953, a sui generis compared to every postwar vintage that I have tasted, a wine that compels me to reassess what Lafite-Rothschild can and should be. The 1953 Lafite-Rothschild has density and precocity, maybe even showmanship that other vintages tend to eschew. It has...chutzpah. That’s not a word I usually associate with this particular First Growth. 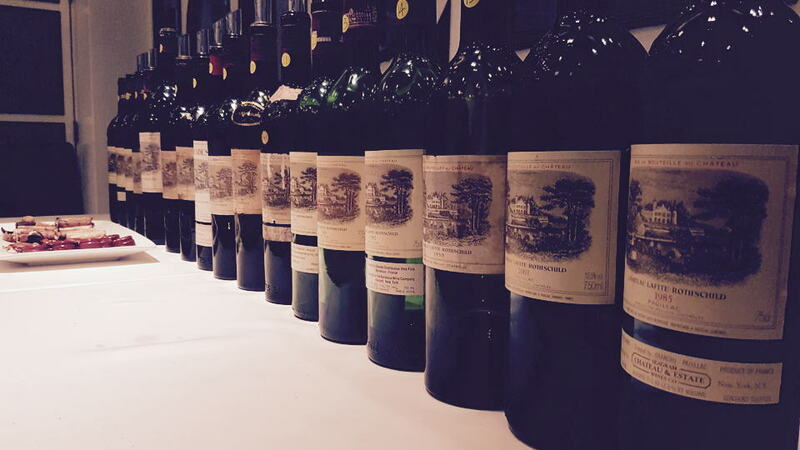 The full line-up tasting in Hong Kong at Amuse Bouche from 1912 to 2001. Lafite-Rothschild is always accompanied by sky-high expectations that derive not only from being in the top tier of the Bordeaux hierarchy. Expectations are amplified by it being the first property listed within the 1855 Classification, the inference that it is the first of the Firsts, the best of the best, ne plus ultra. Second, is its unexpected deification in China. Following the abolition of import duties in February 2008, there followed unprecedented demand and ineluctable price inflation. When a bottle costs so many hundreds of dollars or euros, the fermented grape juice inside had better deliver. These two factors mean that Bordeaux-lovers can be easily and perhaps unjustifiably disappointed since ramped up expectations lie beyond reach. They expect Lafite-Rothschild to be primus inter pares, which for the record, the 1953 Lafite-Rothschild definitely is. However, unlike the other First Growths, I am hard pressed to think of another vintage where it reigns supreme, a Lafite-Rothschild whose thunder shakes the firmament and fulfills the criteria of “perfection” outlined in my Bordeaux in Excelsis piece. For certain there are exceptionally fine wines such as the 1945 (the sublime bottle from the Graham Lyon’s auction dare I say, even better than the ex-château example), 1959 and 1982. Yet are they pinnacles of those respected vintages? Do they take gold of silver medals in those respected years? Dotted here and there are vintages where this hard-nosed critic would suggest that the wine could have been better. I have always maintained that the 1961 Lafite-Rothschild pales against Latour, Haut-Brion, La Mission Haut-Brion and Palmer, principally because I think this 100% Cabernet Sauvignon misses the contribution of Merlot. And to be frank, the 1989 and 1990 Lafite-Rothschild ought to show better. I suppose that all the best have their off moments. Shakespeare wrote a few shoddy sonnets, Paul McCartney penned the The Frog Chorus and the less we mention Jack the better. We forgive them because they are just part of the tapestry that defines an artist’s oeuvre, the contrast required to fully appreciate success. They should be overlooked because it is their masterpieces that they are remembered by and it is masterpieces that form their legacy. Lafite-Rothschild has had its own fair share of wines that fell short of expectations, yet there are wines that deserve adulation. Step forth the 1998 Lafite-Rothschild served from double magnum at the Académie du Vin dinner. Despite competition from numerous venerable Clarets, it stood out for its purity, intensity and complexity, a stunning wine conjured Charles Chevalier sitting opposite me on that night. Both the 2000 and 2001 Lafite-Rothschild are astonishingly fine, the latter every bit as good as its millennial counterpart. I adore the 2009 Lafite-Rothschild that unexpectedly edges out the magnificent 2010, which I habitually prefer among the two. Most recently there is the stellar showing of the 2017 Lafite-Rothschild, the first time in many years where I felt it has the edge of its First Growth rivals. This augurs well for the future and, in my view, is a sign that under head winemaker Eric Kohler, the estate is going to produce some incredible wines. What gives these wines the edge? It is a mixture of the lengths one goes to: the application, the idea of never giving in. Watch the riveting Hearts of Darkness documentary to see the lengths that Coppola went to in order to create Apocalypse Now. That movie almost killed him. It also takes a spark of genius. Watch Dominic West’s astonishing portrayal of murderer Fred West in Appropriate Adult to see how he inhabits a repellant character to the point where West is totally subsumed by the role. It’s about ignoring the rules – innovation and originality. Search Roman Coppola’s video for Funky Squaredance – there is nothing really like it, although on reflection perhaps it mirrors the director putting himself into an artistic piece, as Francis Ford Coppola did in Apocalypse Now on that beach in Vietnam. I know about that because I looked it up on the Internet. A strange fear gripped me, and I just couldn’t ask. 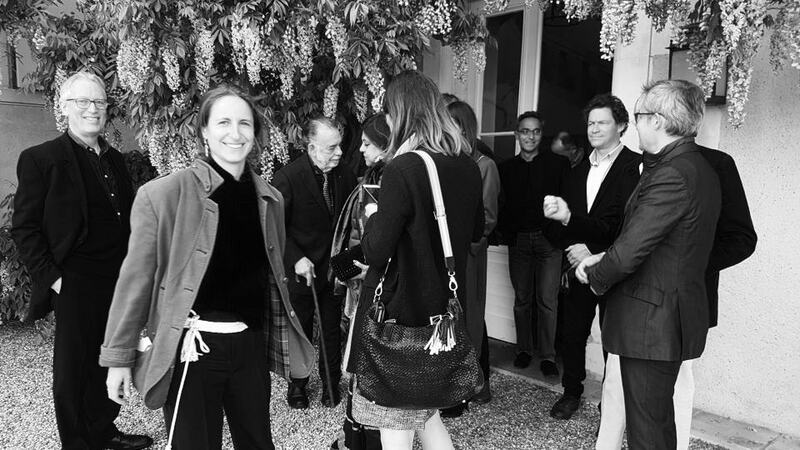 As Saskia de Rothschild takes the helm, she becomes the “director” of the estates under Domaines Baron de Rothschild, except that her “sequel” will come every twelve months. And like any of the person mentioned in this piece, she has a team around her that makes things possible, from Eric Kohler and Jean-Guillaume Prats down to the hard-working staff at the estate. Although the vinous subject of this article is the past, this celebration of 150 years at Lafite-Rothschild was about charting the future.